Home to the bookstore, the campus bar, faculty societies and student media, the Student Union Building (SUB) has been at the centre of student life at Dalhousie since its opening in 1969. 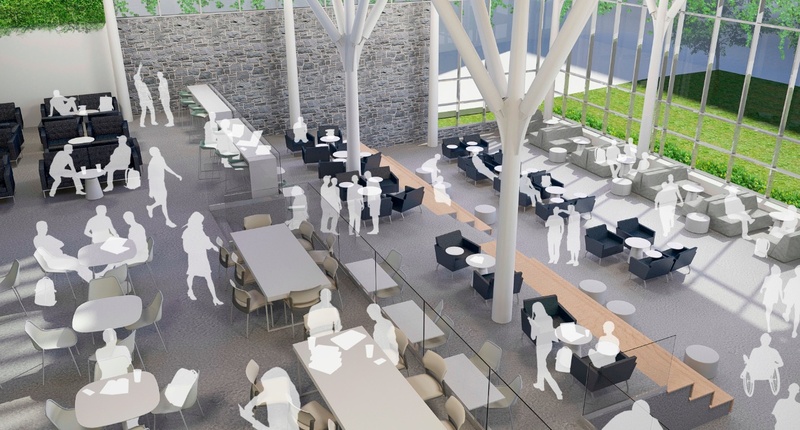 The Dalhousie Student Union (DSU) is preparing to give the facility its biggest update yet—a $10 million renovation project that will radically alter the student space. On Oct. 1, the DSU unveiled the preliminary plans for ‘SUB 2.0’ to an audience of around 40 people. The plan introduces a new entrance to the building, more seating space, a rooftop garden and a society hub. Some facilities will be moved and downsized, such as the Grawood and the bookstore. Others will be transformed: there will be much reduced office space for the Gazette, Nova Scotia Public Interest Research Group (NSPIRG), and various faculty-level societies. They will be incorporated into a society hub, in an attempt to make the SUB more relevant to the average Dal student. Sagar Jha is president of the DSU. “The objective of the renovation is to create a ‘living room’ on campus for students,” says Jha. Jha says that the redesign was necessary. and that it will make the building more inviting and comfortable, with more natural light and fresh air ventilated into the building. However, Jha says that the renovations are not just a matter of comfort. “In a lot of ways, the building is flawed,” he says. It cannot keep up with the increased number of students and their expectations, and it is beginning to look antiquated on Dal’s rapidly modernizing campus. The renovation process began in earnest late last year with a number of brainstorming sessions. The union sent out a request for proposals this summer, and Lydon Lynch, a Halifax-based firm, bested five other competitors for the contract. Tufts has been responsible for a number of recent projects in Halifax, including the Seaport Farmers’ Market. The proposed plan will see many of the society offices in the SUB—such as DalOUT, NSPIRG and the Dalhousie Arts & Social Sciences Society (DASSS)—remodelled and incorporated into a single, open plan ‘society hub.’ This hub will have meeting space and facilities that will then be made available to all 303 student societies. The hub will resemble an open plan office, with free meeting and working space alongside seven smaller offices, made of glass walls, likely for societies with regular staff. The union’s offices and council chambers will also be redesigned to be more accessible and literally and figuratively transparent. Lowe believes that providing more accessible society space in the SUB is still a good idea. “Right now, mostly you come to the SUB for the first floor, the food and maybe the bookstore—if you’re really lucky, the student union offices,” she continues. “I want to get students connected and I think this is a space that can do it. “More gender-neutral washrooms would be sweet,” he adds. Societies that currently lack office space stand to gain from the transformation. Ali Calladine is president of the Dalhousie-King’s Oxfam society, and treasurer of the student society for international development students (IDEAS). Both Lowe and Calladine are unsure about the goal of making the SUB a ‘living room’ for students, while simultaneously serving as office space for societies, student service, and the union. “Dal is a big enough university that if you try to make the SUB this sort of comfortable, everybody-hangs-out-there kind of space, I don’t know if that’s necessarily realistic,” says Calladine. And not everyone is convinced the society hub is the right way to go. Brian Crouse is resource and administration coordinator for NSPIRG. “A one-size-fits-all model for societies might not work,” says Crouse. “Our worry is that there are very different types of societies within the DSU: societies with different amounts of resources and societies that provide different services to students. But everyone agrees that space is an issue. Calladine said the lack of space on campus can be partially attributed to difficulties navigating the booking system at the SUB, and that the university is failing to make spaces available to students. Dal currently occupies the greater part of the fourth floor of the SUB, along with CKDU. The DSU has no intention of renovating the university’s space, but Dal is currently in conversation with Lydon Lynch. Although Dal will soon finish construction on a new building on LeMarchant Street for student services beside the SUB, this will not free up space in the SUB. The ‘mixed-use building’ will be home for a new recruitment centre and an expanded international student centre. Neuman says that the university would like to renovate and expand career services, which will remain in the SUB. Some of this space may occasionally be made available to students. Both Tufts and Jha say that the consultation process has been positive and productive. The consultation process will continue until the end of October, with another consultation session held Oct. 28. Jha has welcomed students to email him personally with their needs or concerns. If all goes well, construction will begin in May 2014, and be finished by September 2015. Jha says there will be little interruption to student services during the 2014/2015 school year. When asked to name a student union building that will serve as a model or source of inspiration for the DSU’s renovations, Tufts struggles to name one. “I can say, for the most part, other universities have far more expensive student union buildings, more modern student union buildings, but they also have a completely different setup,” he says, pointing out the DSU’s relative autonomy. The renovation is currently budgeted to cost around $10 million, with a 15 per cent contingency. The building will be paid for by the existing DSU Renovation Fund fee, a $25 per full-time student levy. The Seaport Farmers’ Market, also designed by Lydon Lynch, went significantly over budget, eventually resulting in the market’s takeover by the Halifax Port Authority. The university has agreed to finance the building at a very low rate, says Jha. In addition, Dal will pay for some of the more costly enhancements because it pays the building’s utility bill. Tufts points out that the renovation project will be a large incentive for the university in its retention of students and recruiting efforts. For many, the renovations appear to offer an opportunity to strengthen the union’s presence on campus. The SUB is seen as exclusionary and inaccessible. “The DSU, one of the big problems they’ve been trying to get over is this exclusivity,” says Calladine, “this DSU bubble, where certain people are in with the DSU and then a lot of people are left unengaged. 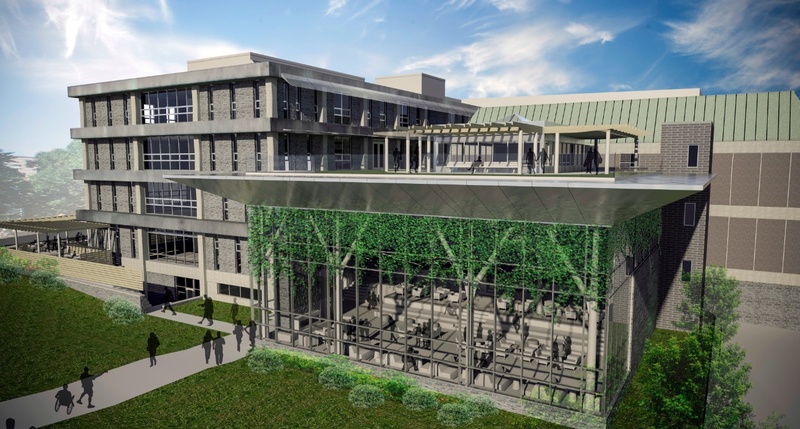 Jha hopes the redesign will revitalize the union.“I think what most excites me is that, once that’s complete and the mixed-use building is complete, the traffic we’re going to see in the student union building, and the cycling onto University Avenue.” he says. But not everyone is convinced by the rhetoric. “It is true that both natural light, beautiful open-concept spaces, and lots of plants, great food service make a space more enjoyable to be in,” says Crouse. But, he adds, “I always worry when I hear language saying ‘we’re going to increase natural light, we’re going to increase open-concept design’ and directly link that to greater engagement in the student union, or make the student union a bigger presence on campus because of these changes to a building. Read our highlights of the new SUB here. I find it hard to continue believing Dal’s “Dire budget cuts scenario” the past few years when it suddenly becomes apparent that much of the university’s budget cuts are going towards new buildings and renovations at the expense of students and faculties. This is goddamn ridiculous; we as current students are entitled to a balanced budget that shouldn’t be passed onto our tuition fees and improved academic environments, not some superficial renovations to distract us that NO ONE asked for. Unfortunately, it’s working. We as students need to act; clearly the new presidents token moment of reaching out through the “100 days of Listening” was a charade. No one cares about the student voice anymore – Not the president, not the DSU, not Sagar, nobody. I’m happy at Dal, it seems you are not since you write paragraphs about how bad everything is at the school. If Dal has so many issues then why are you still attending? I whole-heartedly agree with Disgruntled Dal student. The fact is, there’s a huge shift and change of agenda occurring among Canadian post-secondary institutions. High-school grade inflation aside, the general sentiment among students is that they need a university degree to find gainful employment post-grad. I’m all for broadening one’s intellectual horizons, but it’s generally these same students that demonstrate apathetic behaviours toward their academics and tend to ignore that the university is cutting costs in areas that are decreasing the quality of our classroom experience and education in favour of “superficial building renovations”. It’s these same superficial improvements that are helping attract more international students to the school. Which is good for the university’s bottom line, but it’s severely destroying the higher-education experience of the kids who want it and deserve it the most – the domestic students who are pursuing an undergrad/grad degree out of genuine intellectual curiosity and/or are willing to put in the hard work into their schooling to make the most out of the academic opportunities. I’m all for diversity experiences, but maybe the university should increase the TOEFL requirements so international students aren’t slowing down the academic experience of those who are up to speed. Maybe the university needs to address other issues such as why there seems to be a culture of student apathy in some faculties. Most importantly, the university needs to re-consider their overall strategic vision for the university. I don’t know why this is happening, but it seems like buildings are being built while the in-class experience is deteriorating and key student services are either being cut-back or not up to speed with the number of students that require them. Maybe the students will come to the school if you market the pretty pictures of new buildings, but once the good ones find out that’s all the school has going for it – the retention rates are going to take a hit. Take care of the academic experience and well-being of the domestic students before you start upgrading and expanding. Band-aids such as merit scholarships for them will only work for so long. Or maybe universities will realize this only after they see the good ones resorting to schools with private education fee structures to ensure they’re getting a quality education. But maybe we’re coming into a time where that’s what it’s coming to, because evidently our higher-education institutions are expanding facilities and volume at the expense of key intrinsic experiences to accommodate – what in my opinion is – the higher-education bubble. The only people benefitting are the international students.